Pinay WAHM: Awards here and there!!! What a wonderful way to wake up. Remember those actors and actresses who are nominated for the Oscar's or Grammy's or Golden Globe's? Normally, the nominations are done very early in the morning. So the 'wannabe' nominees are usually at home either still sleeping or waiting for their names to be called. I can relate to those sleeping nominees and are being awoken with calls of congratulations. Yep, that's how I feel now....o di ba ang haba ng intro. 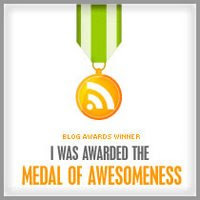 Anyway, thansk to 2 of the sweetest blogger friends I have in my list, Denz and Michelle who handed me this "Medal of Awesomeness"...awesome daw, oh! Same goes to the two of you!!! This second one was given to by Michelle, yep, the same Michelle. It's really pretty kasi roses, eh. I really like white roses or red ones or yellow ones. Yes, I like roses. They also smell good. 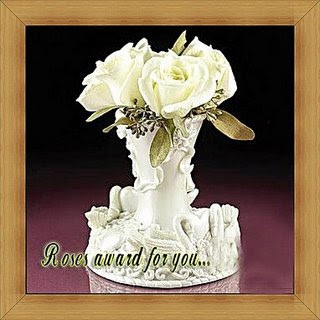 So thanks Michelle for this very pretty award.